A surprising performance by Susan Boyle and an awesome Red Bull-sponsored space jump couldn't outperform the power of a meteor. 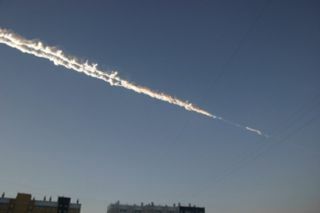 According to a report from Visible Measures, video of last week's unprecedented meteor crash in a Russian city has generated over 100 million views across over 400 uploads in just three days' time. That sets a new record for the fastest video clip to reach such a high viewer number, even outperforming the Red Bull: Stratos space jump that took place late last year. Each of the videos highlight different viewpoints of the meteor's impact, from its fiery fall in the sky to the effects of its impact, including shattered glass and slight injuries. Some didn't show the meteor at all, but rather the way the lighting around the city changed with its passing, or the smoke trail it left in the sky. The most viewed video came from RussiaToday, a global news channel, which generated over 23.6 million views on its own. An additional 160 clips also managed to get over 100,000 views apiece, and so far, the total sits at 138 million views and counting. The meteor managed to reach the 100 million mark in just three days. That's a staggering number compared to the five days it took for the Red Bull: Stratos space jump to hit that mark. Prior to that, the Kony 2012 video, advocating the arrest of Ugandan guerrilla group leader Joseph Kony, reached the historic mark in six days. And before that, Britain's Got Talent held the record with a clip featuring a stunning performance by singer Susan Boyle, which generated 100 million views in just nine days. This story was provided by TechNewsDaily, a sister site to SPACE.com. Follow TechNewsDaily on Twitter @TechNewsDaily. We're also on Facebook & Google+.